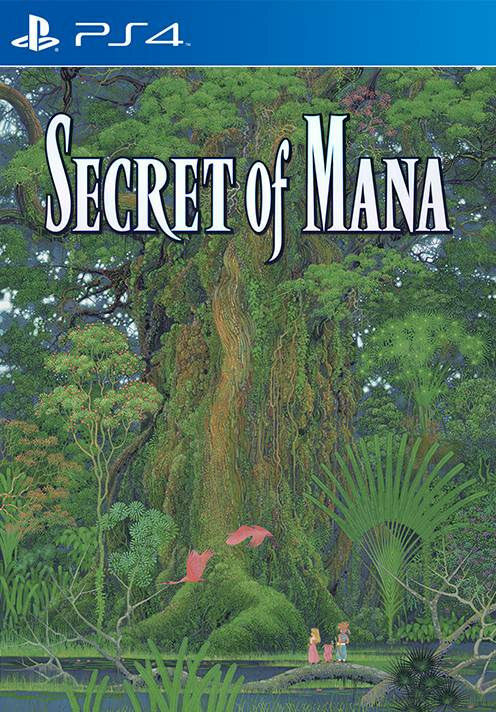 The Secret of Mana is an RPG that I had heard of in passing but never focused on too much. It just got lost in the shuffle next to Final Fantasy and Dragon Quest. Well thanks to the HD PS4 remake I have finally gotten to play it. It’s definitely a great RPG as you would expect and the real time/turn based mix will remind you of the .hack series. I renamed the main characters so bear with me here. Terry is the chosen hero who is finally able to wield the Mana Sword. Everyone is shocked and dismayed because once the sword is lifted the world is supposed to fall into ruin. Terry meets a girl named Terret who needs help in stopping a witch to rescue the hero named Dyluck. Unfortunately this is a dead end but she must continue on her quest and since Terry has nothing more pressing to do at the moment he agrees to join her. Finally, they run into a sprite known as Terry Jr. who was scamming people for money. We show her the error of her ways and add one more member to the party. Now we must attack the enemy fortress and save the planet! The gameplay is a blend as I mentioned earlier. You have a number under your character. Once it rises to 100 you are free to attack again and deal some damage. While you can attack sooner than that, it will almost definitely miss and even if the attack lands it will be weaker. Furthermore, the count will go back to 0 so waiting it out is just the better option. Also, you should start leveling up your magic early on as it is incredibly useful. Level them all up if you can, but you should focus on 1 in particular to get it to a high level early on. The Gnome magic was really useful for me, but each boss is typically a different element which is why you want a lot of them. Equipment is extremely handy in this game as well and is basically mandatory to clear the game. You want the top of the line stuff and if you think you can beat an area without purchasing some armor then wait til the next village. Each village gradually adds better equipment options so you save a lot of money by just waiting. Of course, earning money is actually pretty easy in this game so it’s not something that you have to worry about that much. It will come naturally. Likewise, the EXP grind here isn’t bad either. It will go very quickly. That’s why you just want to stay at the top of your game since the A.I. won’t help much. They tend to just get crushed very quickly throughout the game. Terry is a reasonably solid main character. He does actually talk and everything so he has a real personality. His personality is that he’s a hero and while that may not be all that deep or anything, the character means well. We do get a random plot twist involving his Mom which was kind of out of left field, but Terry took it in stride. Terret is a solid heroine. Her whole adventure is about saving the legendary Dyluck which is a nice twist of events. You rarely see the heroine have to go and save the famous hero and I can definitely get behind this. Shockingly they don’t even try to get you into a contrived romance with her as Terret only has eyes for Dyluck the whole game. I can applaud the title’s restraint here. Terry Jr probably has the least time to get really good, but she’s not a bad character. I still don’t get why she is referred to in the plural sense, but I don’t want to assume that it’s a translation error. Either way, she helped to raise everyone’s spirits. As far as the villains are concerned, I would have liked them to have had more screen time. The villain group shows up out of nowhere and half of them are defeated quite quickly and without a chance to really show off their personalities. The King who makes a deal with the main villain wasn’t very smart, but made for a decent antagonist. Thanatos is the main villain to watch out for and he is definitely pretty strong. I like the design and he made for a cool antagonist. Then we have the Team Rocket trio who felt really out of place. They weren’t quite as hype as the others. One major plot point is that you have to choose a side. Destroy the Mana Beast or destroy the Fortress. I felt like the game couldn’t really decide which the right option was as the Fortress is evil from the start, but by the end of the game we decide to destroy the Beast instead to balance things. This was part of the main plot and it made no sense. Now, I know a lot of behind the scenes stuff happened with this game and that is probably what made the plot feel rather off at times. It’s unfortunate but that’s also part of why I consider this RPG’s plot to be one of the weakest RPG plots in a while. It takes a little bit to get going and then once it does it’s like we’re playing an abridged game. Not to the same extent as Sonic Forces fortunately, but enough that parts of the plot feel weird like with the Beast. Personally I would have helped the guy, but apparently he was going to destroy the planet in the process so I suppose that wasn’t a viable option. Then we have a guy named Genma who talks tough throughout the game, but never actually got to do anything. Ah well, at least he looks rally tough. The graphics were switched from sprites to 3D character models which usually works pretty well, but perhaps not in this case. The boss designs looked a little more intimidating in the original version and the colors were nice and sharp. As far as the cutscenes go, the characters don’t actually move their mouths while talking half of the time. Not a big deal I suppose, but basically it had the art style of World of Final Fantasy without the detail. I guess if this allowed the game to come out a few years early then it was probably worth it. As far as the soundtrack goes we have quite a few tunes. Each area has a different theme and they all work pretty well. They are classic rpg style themes so they should remind you of the good ole days. The length of the main campaign is roughly 20 hours give or take so it’s definitely a solid amount of time for the rpg. You will almost certainly need to grind by the end so I’ll give you a pro tip here. Max out your Dryad skill since you cannot defeat is he final boss without it. I made it to the final boss without leveling it up at all which meant I had to go back and grind it out. If you level it naturally then it won’t actually feel like a grind. You’ll probably end up shaving an hour or two off as well. For replay value you can probably nab most of the trophies to end up with the Platinum. Out of the 38 in the game, I think around 26 are obtained just for completing the game. That’s a pretty solid number if you ask me. If you want to get the Platinum then you need to make a backup save before you beat the Blue Dragon as there are some rare item drops that you can’t go back for. It’s probably a good idea to defeat every new enemy you see as well to register them. Getting the Platinum here isn’t hard at all but it does take a little time and nobody wants to replay a 20 hour game just to get one missed trophy. Overall, Secret of Mana was a pretty fun game. As far as RPG stories go the plot was rather weak, but the gameplay was still enjoyable. I just love RPGs in general as leveling up and grinding can be a blast. I can see why they got so big back in the day. Many RPGs will end up being quite solid by the end since you get used to the characters as you shared so much time together. This one is no exception and there is certainly a lot to do. Even without replay value, the story length justifies the price that you paid for it. Maybe I’ll get to play some more Mana games in the future. Until then, I recommend checking out this game and seeing what the Secret of Mana has to offer you. It’ll test your mettle one way or the other. This entry was posted in 8 Star Games, Game Reviews, Games, Reviews and tagged Game Review, HD Remake, PS4, Remake, Review, RPG, Secret of Mana, Sony, Video Game Review by dreager1. Bookmark the permalink. I almost bought this, but I decided to wait for a price drop. Glad it got a physical release in the US unlike I Am Setsuna, but it stinks it was exclusive to GameStop. Ooo! I like easy platinum trophies, haha.